Front-line managers can make or break your company's success. But most new managers don't get the training they need to be effective. 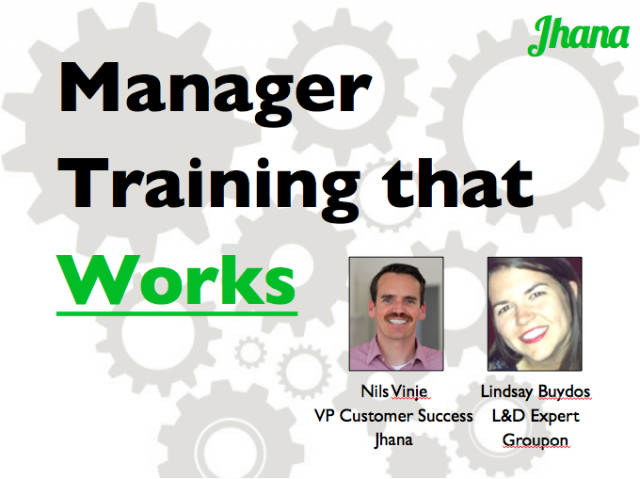 In this free 50-minute webinar, Jhana's VP of Customer Success, Nils Vinje, chats with L&D expert Lindsay Buydos on how she developed and scaled a training program for hundreds of new managers at Groupon and got great results. Manager training is an essential part of helping new managers succeed. But for training to really work, HR leaders need to help managers apply what they've learned in class to their day-to-day jobs. In this free webinar, Nils Vinje, VP Customer Success at Jhana, interviews L&D veteran Alison Hu, on how she developed and reinforced successful manager training programs for leading tech companies like Yahoo!, HP, and VMWare. Jhana is an online toolkit for first-time and front-line managers at tech companies. Our content offers bite-sized, practical guidance in the moment of need. You won't find long courses or people in suits, just actionable answers in an accessible format and a modern voice. Leading tech companies like Eventbrite, Match.com, and Groupon use Jhana to reduce turnover, boost morale, and scale their companies. Learn more at jhanaeducation.com.